Two years ago, Mark Bittman came up with 101 easy-to-make summer meals, and being an aficionado of all things in list form, I decided to make my way through the lot. I got through about two dozen, almost all of which were great (and, I discovered, I really quite like anchovies). Well, now there’s a new list — 101 Simple Salads for the Season — and I’m giving it a go. Here’s our first entry: 15. 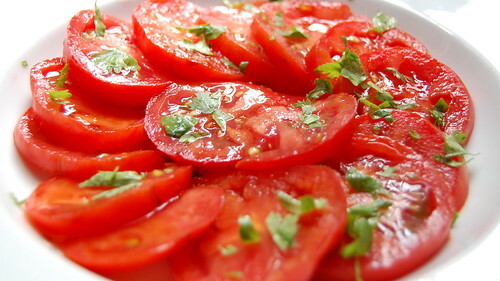 Cut cherry or grape tomatoes in half; toss with soy sauce, a bit of dark sesame oil and basil or cilantro. I love this — the tomato juice-soy thing is incredible. I honestly think I may never eat tomatoes any other way ever again. It doesn’t seem like it would be that great, but the salty/savory/pungent combination of the soy sauce, sesame oil, and cilantro is a perfect match for tomatoes at their peak of sweetness. Oh, Mr. Bittman. Between this list and your recent semi-retraction on your canned beans stance that got me so riled up, I think I might really like you again. Kristen, this sounds amazing! I’ve been thinking about doing more with cilantro these days and hadn’t studied Mr. Bittman’s most recent 101 enough to find this. Thanks! And I’m with you on his recently recanted stance against canned beans. We use them all the time.